NeTEx has been developed under the aegis of CEN (Comité Européen de Normalisation) and is the most recent development stage in over fifteen years work to systemise and harmonize European passenger information data. The work draws on a number of existing national standards such as VDV452(de), NePTUNE (fr), TransXChange (uk), and applies systematic principles of information architecture to construct flexible models that correctly separate the different concerns of representing and managing data. The keystone is the CEN Transmodel standard, a conceptual model which names and represents PT info concepts for a wide set of functional areas and can be used to compare and understand different models. Transmodel project outputs have previously been used both to underpin a number of CEN concrete data standards such as CEN SIRI and to rationalise national standards to allow for harmonisation and interoperability. IFOPT has been used to develop NeTEx and is itself being updated to include NeTEx additions. CEN Europe’s standardisation body divides its work into committees covering different aspects of industry and technology, with a well-defined process and documentation formats. NeTEx transport standard is formally produced by Technical Committee 278, Work Group 3, Sub Group 9. 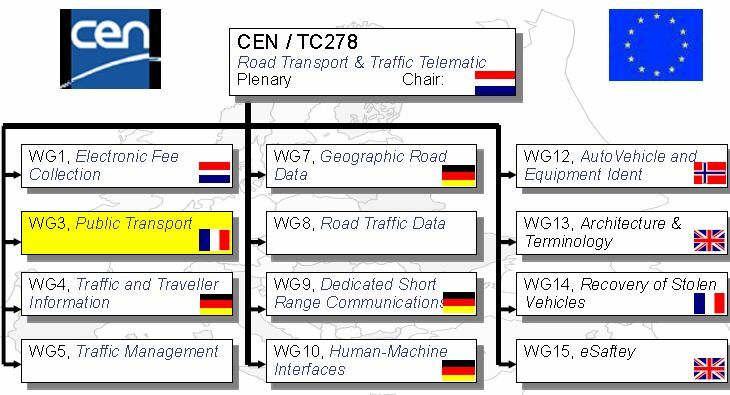 Other TC278 WG3 sub groups handle the related standards Transmodel (SG4), SIRI-Service interface for real-time information (SG5) and IFOPT -Identification of Fixed Objects in Public Transport (SG6).